Originally from London, England, Catherine grew up mostly in Massachusetts. she went to college in New York City and returned to Massachusetts , attended graduate school and then started Project Smile. Catherine currently lives in Central Massachusetts. When she's not working or organizing Shoe Club events, she loves cooking, photography, reading and playing board games. Smiling Stiletto Shoe Club has been hosting fashion shows since 2011. They have always been fundraisers for Project Smile. Previous shows were held at a variety of venues including Copley Place, Assembly Row and Boston’s Harborside Inn. 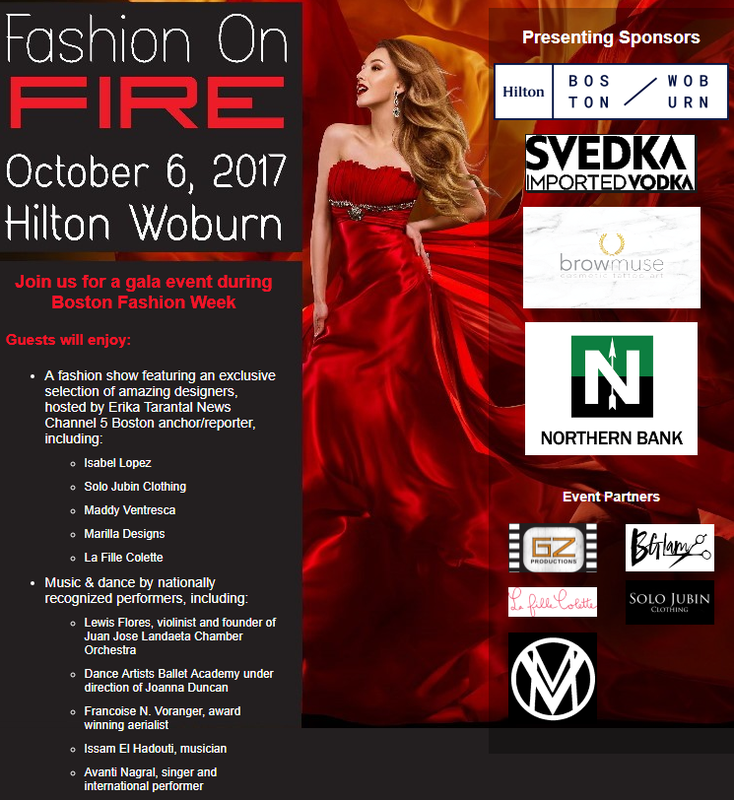 Fashion on Fire will be one of their largest productions to date, featuring an amazing assortment of musical performances, ballet and an aerialist along with an incredible fashion show and cocktail party. The number of vendors with special shopping opportunities and the wide range of silent auction items also help to make Fashion on Fire one of their biggest events. Catherine's team are always looking for volunteers to get involved with Project Smile. There are lots of ways to support their efforts, including organizing a collection, starting a local chapter or getting involved with upcoming events. I was a member of Shoe Club prior to taking over the group. I read about the club in the Boston Globe and attended my first event where I ended up winning the Best-in-Shoe competition. I was immediately hooked! I loved the camaraderie within the group- from the very beginning it was a welcoming group of diverse women. I met one of my best friends through Shoe Club. The simple premise of bringing together women who love shoes to socialize and have fun. IN 2010, the lady who ran Shoe Club moved away and I took over running the group. I gave it a new name, new website and Smiling Stiletto Shoe Club was officially born. What brand of shoe should every woman own? I don’t think there is a particular brand that every woman should own. You should own good quality shoes that fit well and make you feel amazing. Whether that means a pair of shoes that is $50 or $500, it doesn’t matter. It’s all about what makes you happy. Ah, there are so many amazing shoe designers creating beautiful shoes! Stuart Weitzman is one of my favorites- gorgeous shoes that fit amazing. Locally, I’m a fan of shoe designer Thom Solo who creates breathtaking shoes. My biggest accomplishment is starting Project Smile in 2003. It started with only one little idea and I had no idea it would become my full time career for the next 14 years. I consider myself lucky to be able to have a job that I love and be able to help thousands of children annually through our efforts. Best and Worst moments in fashion? My personal best moment in fashion was the first time I modeled in one of the Shoe Club fashion shows. I don’t even remember the name of the designer dress that I wore- it was something that I never would have chosen for myself- cream colored, avant-garde style cocktail dress paired with red Stuart Weitzman heels. My hair was in an up-do and my makeup was more daring that I had ever done myself. It was a whole new look for me and was so exciting. I felt like a different person. My worst moment isn’t a bad moment, but it was the first time I realized how people judge what you wear. I was 6 years old and attending school for the first time in the USA- I was a transplant from London. We went for class swimming lessons at a nearby pool. I remember walking out to the pool and the other little girls were outraged by my swimwear- a black bikini with bright polka dots. I remember being shocked that the other kids thought something was wrong with what I was wearing. They were all wearing one pieces and my 2 piece was too much for them. They asked me where I got it and if my parents knew what I wearing. I was 6 years old- I definitely wasn’t buying my own swimwear! I felt self conscious for a few minutes, then I remember deciding that there was definitely something wrong with them. What is the current state of Boston Fashion? I think there are lots of exciting things happening in Boston Fashion. While working with our Fashion on Fire Production Director, Olga Kwasniewski, I have been blown away by the sheer talent of the local designers that she recruited for our event. There are people toiling away in our city, creating amazing fashions every day. It is truly inspiring to see their creativity and the passion that they have for their work. There is a vibrant fashion scene here and it is great that Boston Fashion Week gives an opportunity for designers to raise awareness for their work. How do members of the shoe club meet / collaborate? Does Smiling Stiletto Shoe Club take heel donations? What are the core initiatives of Project Smile? Project Smile is a non profit organization, dedicated to helping children who have been victims of traumatic events. We donate stuffed animals, coloring books/crayons, small toys and children’s books to police and fire departments for police officers, fire fighters and paramedics to give to children immediately following a traumatic situation. Since our founding in October 2003, we have donated over 38,000 stuffed animals and work with 197 police and fire departments throughout New England many local departments. Many of the children who receive these items were involved in car accidents, witnessed domestic violence, are victims of child abuse or other violent crimes, coping with the loss of a loved one, or sick/injured. We also work with the Department of Children and Families to donate stuffed animals and other items for children entering foster care, many of whom have few, if any, personal possessions with them. Project Smile also donates stuffed animals and other items for children who are living in homeless shelters. What does the Smiling Stiletto Shoe Club mean to you? Smiling Stiletto Shoe Club means so much to me. I am very proud of the fun events we’ve had and the friendships that have formed from our group. I especially love the diverse group of women that attend our events. It is wonderful to see women from so many different backgrounds come together and bond. While it is about the shoes, it is also about more than shoes- it’s about building our own little community where everyone feels welcome and included. Today, more than ever, we all need our community. Where do you see yourself / brand in 5 years? I see Project Smile in 5 years expanding the scope of its service. We’ve already expanded beyond the usual items that we provide for children and we want to continue to expand on a larger scale and perhaps offer service for families in need. For Smiling Stiletto Shoe Club, I would love to see chapters of the group in other cities. There are shoe lovers everywhere and you shouldn’t have to live in the Boston area to enjoy a Smiling Stiletto event! Top 3 things it takes to successfully strut in stilettos? Confidence, good balance and a great attitude!